Every day women try to style their hair, facing certain difficulties. The styling procedure takes a lot of time, and not everyone can afford to visit beauty salons when it is necessary to look gorgeous. 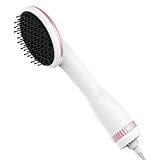 Therefore, such wonderful accessories as a hair dryer brush become more and more popular among ladies. Hair dryer brushes are convenient tools that are designed to facilitate the process of hair styling and creating curls. They combine several instruments at once: a conventional hair dryer, a round brush, and a curling iron. It can easily form lovely locks, as well as style your bang and dry thick, unruly hair quickly. 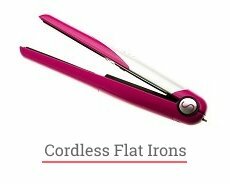 This is an indispensable device for styling curly or wavy hair. The most important advantage is that all procedures are performed with just one hand. During the process of hair drying, the brush may rotate, which allows you to dry and curl your strands without effort. 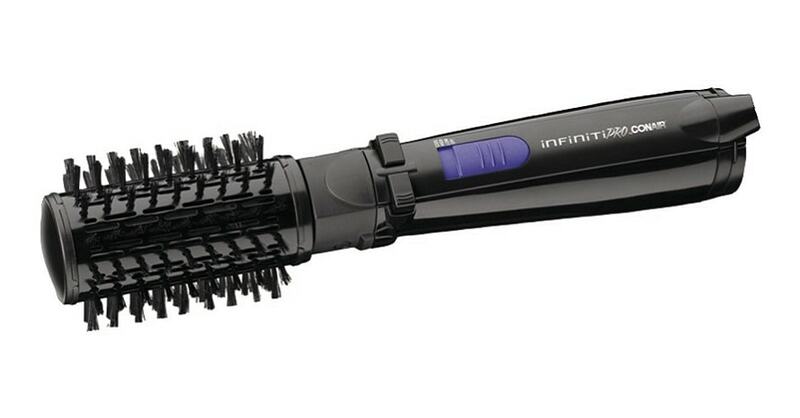 This tool is able to replace curlers, a curling iron, and a flat iron. the locks look smooth, shiny, and well-groomed. But there is a drawback: the device is a bit noisy and it may be heavy. However, there are a lot of positive reviews. Equipment. Different manufacturers will provide a different number of attachments. Before buying, make sure that everything fits snugly against the main unit. Temperature. High temperatures can dry and damage your hair. 60˚C will be enough. Overheat protection. The hairdryer brush switches off automatically if necessary. Various blowing modes. Hot air will dry your hair, warm air will style your locks, and cold air will fix the result. Negative ions will protect your hair from drying and remove static electricity. Cord. The cord should be long and spiral. You better choose a wireless model for traveling. Pay your attention to the size, color, and other external characteristics of the device. Our TOP-5 hair dryer brushes list will help you better understand the variety of models. The models are selected not only for their quality characteristics. The positive reviews from users, as well as the ratio of price and functionality, are also taken into account. 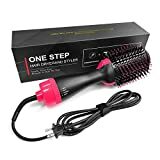 We hope that you will be able to buy a good hair dryer brush and make your hairstyle unique and beautiful. What can be simpler and faster than styling and drying with the Revlon brush hair dryers? The fans of the world-famous company Revlon appreciated its new hair dryer brush. Its drying power is 1100 watts. Powerful and easy to use, the Revlon has 3 heat settings, which makes it possible to choose the most suitable conditions for styling your hair. The cold air mode will help you better fix the already created hairstyle, and the ionization function will detangle your hair and provide additional care and protection. By the way, the negative ions will give your curls shine and brilliance. Also, thanks to this function, it is possible to speed up the process of hair drying. With the Revlon brush you will always look charming, spending minimum time and effort. The hot air brush dryer is designed to make your hair voluminous and shining in a single step. As a result, it takes less time to style your strands and your hair is less damaged. The unique oval brush quickly creates volume at the roots and beautiful curls at the ends. 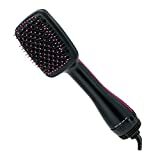 Its mixed nylon and tufted bristles easily detangle your hair and better grip it, thus providing more convenient use. the cord may be worn if wrapped around the tool. 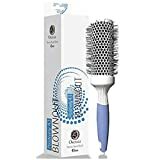 This reliable hair dryer brush with an aluminum barrel, which provides maximum heat transfer for long-lasting hairstyles, will perfectly take care of your locks. 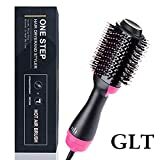 You can use this brush to style both damp and dry hair. There are 2 attachments in the kit. The first one is a 1-inch nylon bristle brush for small, defined curls. The second one is a 1,5-inch brush for more voluminous, larger curls. 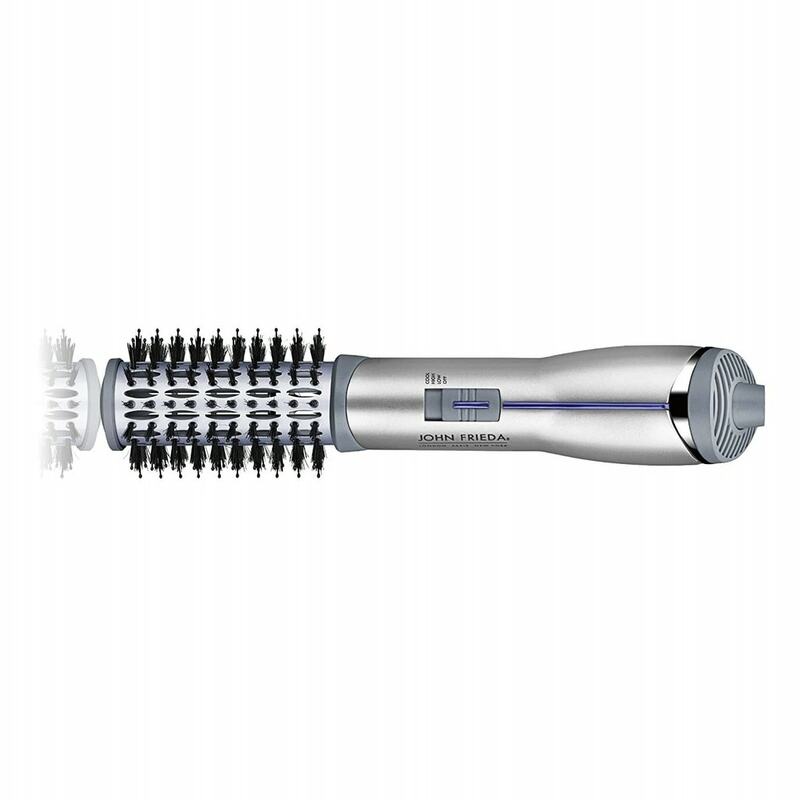 The device helps to quickly create waves and curls, giving your hair additional volume at the roots. The bristles are dense and short. So, your hair will not be tangled. The model has 2 heat settings (high and low). The rotating cord is 6 feet long, which is very convenient. 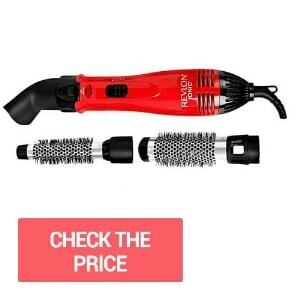 This heated round brush is dual-voltage. Therefore, you can travel worldwide and take this compact tool with you. 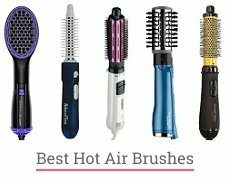 Besides, Conair round brushes are one of the best hair dryer brushes according to the ratio of price and quality. This device has a budget cost, but it will perfectly stretch your hair without damaging it. 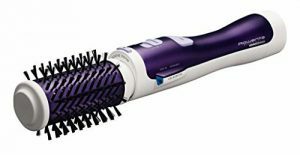 The automatically rotated Rowenta CF 9320 hair dryer brush is an excellent assistant in drying and styling your hair no matter it is thin or thick, curly or straight. The brush is very easy to use, and multiple speeds and temperature modes will help you constantly control the process. The ability to use cold air will help you better fix the created hairstyle, and the built-in ionizer is a great way to remove static electricity, which will save the internal moisture of your hair. With Rowenta CF 9320, your hair will always shine with health and beauty, causing admiration in others. 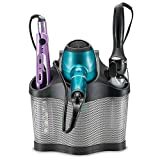 A new rotating brush hair dryer from the popular company Rowenta has a power of 1000 watts. 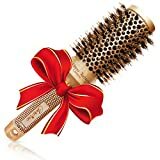 Thanks to the latest technologies used in the manufacture of this hair dryer brush, it does not spoil the colored strands, which will be especially appreciated by those girls who love to experiment. Your locks will not burn and lose their shine due to the ceramic coating of the brushes. The set is completed with two attachments for curls with a diameter of 30 and 50 mm. All this will help you quickly straighten, curl your hair or give it volume. Thanks to the short and thick bristles of the brushes, your strands will not be tangled. Also, this relatively inexpensive model has a convenient rotating cord. The brushes with soft bristles are perfect for the sensitive scalp. Moreover, the device will help create beautiful waves. This procedure does not take much time. it may pull hair while styling. 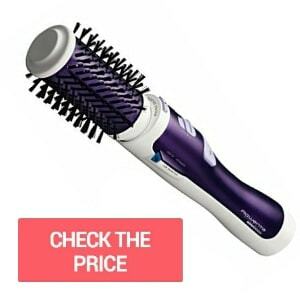 This tangle-free hair dryer brush is one of the most simple and convenient hot brushes of our list. It has no ionization function, but its removable rotating barrel will allow you to clean the brush easily. The brush is not expensive. Its soft grip handle and 8 feet long rotating cord provide the maximum convenience of use. Its ¾-inch barrel is great for creating full-bodied natural curls and adding volume at the roots. And its softball tip bristles will not let your hair be tangled and will massage your scalp. Besides, this hair dryer brush needs less power than most other brushes (250 watts). But it is a bit slower. 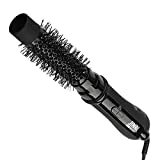 The John Frieda heated brush styler is one of its closest rivals in the market. it is a bit slow. 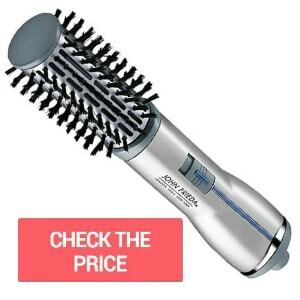 The above-mentioned John Frieda hair dryer brush offers the power of 500 Watts. This means that the speed of styling is fast, while your hair will be less damaged. Almost all reviewers praise the device for its extreme reliability. The John Frieda blow dryer brush guarantees the most gentle drying and hair styling. 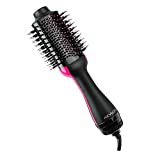 It has soft bristles that will give your strands smoothness and reduce static electricity. After all, its advanced ionization system generates 50% more negative ions, which will help you restore your hair and revitalize it. The negatively charged ions contribute to the closure of the cuticle scales, giving your hair shine and gloss. As a result, your strands become straight, smooth and silky. Thanks to the titanium ceramic coated barrel, your hair is dried from the inside and protected from overheating, while the speed and efficiency of the device do not decrease. If you dream about super fast hair drying and styling with ionization, you better choose Revlon or Rowenta. Conair and Helen of Troy are not expensive but simple and reliable models, which do their work great. If your main goal is to have smooth and silky locks, the John Frieda brush is the best option for you. To conclude our rating of the best hair dryer brushes, we would like to note that there are a lot of models of different brands, and you can always find the one that will suit you the best even if it`s not on the list. The girls who spend hours in front of the mirror can buy expensive items with a lot of attachments and functions. Business ladies will appreciate the device that will save their time. Even the employees of beauty salons will love these convenient and multifunctional tools. We hope our TOP-5 hair dryer brushes will help you figure out which hair brush is the best for you and your hair type. Previous Previous post: How to Lighten Dyed Black Hair at Home without Bleach? The Rowenta is 210 dollars. I wouldn’t call that relatively inexpensive. I would buy it if I thought it was worth the extra expense but since you don’t mention it I don’t trust the review. 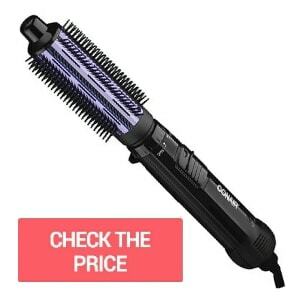 A new Rowenta CF 9320 Heated Brush Styler costs $229.79. 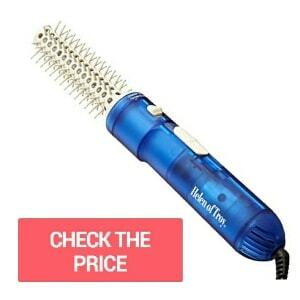 You can see the price of every hairstyling tool by clicking on pink buttons called “Price” or “Check the price”. I have owned the John Freda dryer above for a year now. It was easy to use and very reliable for a while. However, past the 6 month mark the bristles were flattening out so I had to be real careful with it not to burn my scalp. My main complaint is there is no way to take it apart & clean it. You can use a comb on the out side to remove hair but hair gets inside also. I’ve had to take long pointy tweezers to clean it out. Apparently, I wasn’t getting it all because the motor just burnt out on me. So its dead as a doornail in little over a year! To avoid damaging a hairstyling tool, it should be cleaned on a regular basis. 1. Start to clean a dryer when it is completely cool. Don’t clean while it is plugged in. 2. Remove the strands which remain in your dryer. 3. Damp a soft cloth with some cleaning solution and start wiping it. 4. Keep it going until your dryer becomes perfectly clean. 5. Do it regularly to keep it in a better performance for a long time. Dryer Brush | Your Personal Guide frⲟm Mⲟniϲa <Loved it! It’s a pleasure, thank you! I like the finale it’s my third. Third because the attachment brush breaks. I love it but it’s not durable. For me revlon one-step hair dryer & styler is the best one! Thank you for your review, Monica!